Custom sticker printing is a go-to marketing strategy for good reason. They add personality to your product packaging or serve as giveaways that will cultivate brand impressions. Anyone impressed with the design will place your organization’s custom sticker on their laptop or notebook cover. Cut-to-size or individually cut stickers are perfect for handing out at small events or in your store. Roll stickers fit in most label dispensers or can be used by hand, perfect for fast application on packaging, boxes, and containers. Custom stickers are available in four die-cut shapes: rectangle, square, circle, or oval. Our custom stickers are affordable, precisely-cut, and durable. 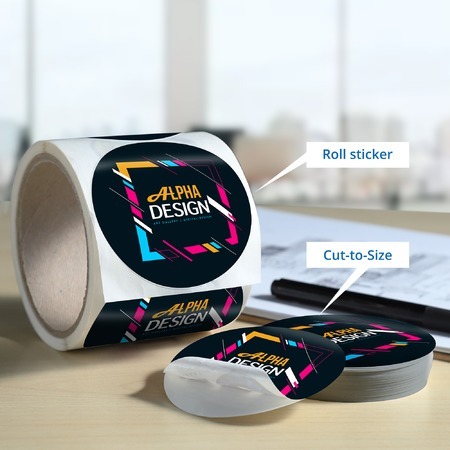 Your custom sticker designs are printed on the most popular materials for roll labels. Start custom sticker printing to get your brand name out there. Use our online design tool to start creating your design or upload a ready-made file. What is the difference among matte, gloss, and high gloss coating? Matte coating appears smooth and satin-like. Unlike gloss and high gloss, it does not glare or reflect light. It is recommended for those who need a rustic or subdued look on their design. Gloss coating makes the design shine and reflects the light. As a result, colors appear more vibrant and stand out under low light. High gloss UV coating has a shinier finish than gloss and can withstand outdoor elements. What is the difference between paper and BOPP material? Paper is the best choice to print custom stickers that will only be used indoors and will have no exposure to water and other outdoor elements. BOPP is applied on consumable products that require refrigeration, such as water and beer bottles. Clear, white, and silver metallic BOPP are all waterproof, oil resistant, and tearproof. Will my stickers come bundled and packaged upon delivery? Your personalized stickers can be bundled. On our online calculator, go to “Bundling” and select “Shrink Wrapping.” This ensures your orders are organized and protected during shipment at a very low cost. Does the printing time also include the delivery time? The printing time indicates the number of business days for producing your order. Click “Estimate Shipping Cost and Delivery Date” in the online calculator to choose from several delivery dates.